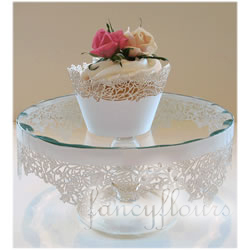 Just in at Fancyflours.com: Cake Stand Wrappers!! These gorgeous wrappers can be used to add pizazz to any cake plate, cupcake stand or tray in merely minutes! Simply connect the wrapper pieces, affix to cake plate and watch other “ooh” and “ahh” over your fabulous display! These wrappers come in several designs and colors perfect for many party occasions including Weddings, Valentine’s Day and Spring! 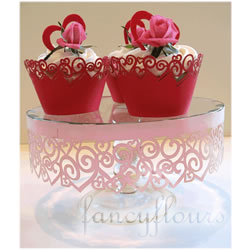 To view our complete line of Cake Stand Wrappers please visit www.fancyflours.com. Don’t forget to check out some of the coordinating Cupcake Wrappers to match your Cake Stand Wrappers at: http://www.fancyflours.com/site/paper-goods.html. 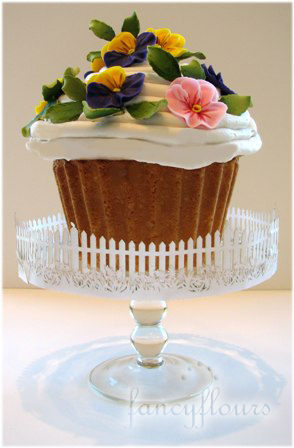 This entry was posted in Cupcake Recipes & Ideas and tagged Add new tag by Fancy Flours. Bookmark the permalink. Hi, Love the new cupcake wrappers! But tell me, what are the “jewels” on the cupcakes in the newsletter I received? Your site and blog are inspirational! OH! ALL your works are beautiful! *0*. And they se so delicious.